In May I attended a work related event in Oswestry, Shropshire and I thought that this would be a good stepping stone to visit another highpoint in the area, after much deliberation I decided that after my work event I would drive across Wales to the far north west corner and visit the Isle of Anglesey for a few days. I decided early on that I would be camping at the work event in Oswestry so on the morning after the work event on the 20th May I packed up my tent and headed off to North Wales. I stopped off in the town of Oswestry on the way to pick up some supplies and have some breakfast in a small cafe and then I was off again for the drive through Snowdonia national park and across the Menai Strait and on to Holy Island where my campsite was situated. The campsite I was staying at was one of the best I have ever visited, It was peaceful, had AMAZING views and had excellent facilities with breakfast available if they are needed, I was actually the only camper onsite for most of the time so it was really wonderful. After setting up my camp I decided to go for a walk, this took me out towards the coast near South stack and it was here I caught my first good views of Holyhead mountain, I also got to see the 206 year old South Stack lighthouse perched precariously on the cliffs overlooking the Irish sea. I have always been a lover of lighthouses and it was good to see 2 of my passions in 1 place, a lighthouse and a highpoint. I eventually wandered back to my campsite and got some rest ready for my busy day ahead. The lighthouse on the left and the highest point on the right. 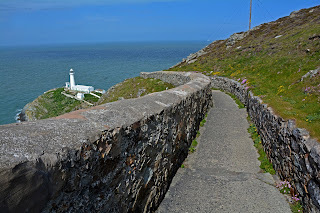 The next morning I woke and had some breakfast then I headed off for an explore of the South Stack lighthouse. 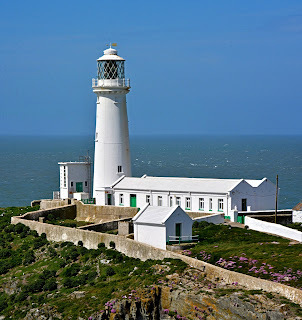 It was not far away and I parked at a RSPB information centre, it was here I discovered the vast array of birds available to see on the cliffs in the area, I was very excited to learn that puffins had been seen recently AND the lighthouse was open to visitors. 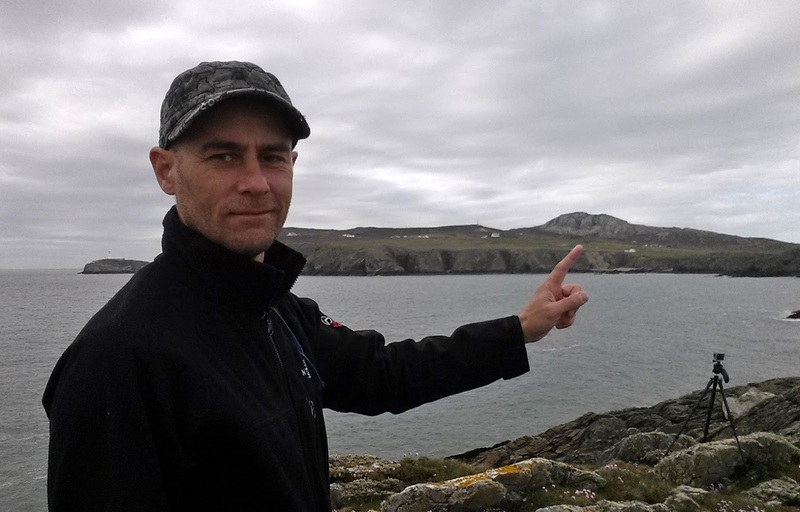 The RSPB shop had binoculars for hire so I got a pair and headed off down the path to the lighthouse with a rough idea of the locations of the puffins. The path zigzagged down the edge of the cliffs and I kept stopping to search for those elusive puffins but no matter how much I searched the cliffs I couldn't see any, further down the path I stopped and got a good view of the cliffs and still there were no puffins, there were thousands of other birds in the skies and on the rocks and also below on the sea but no sign of puffins, I had been warned that they may be nesting in their burrows. I searched and searched and eventually started moving my search to the thousands of birds on the waters below and then eventually I spotted the familiar shape of a puffin on the water, in fact there were 3 of them, I was so happy to have seen the birds, real puffins in the wild, incredible. 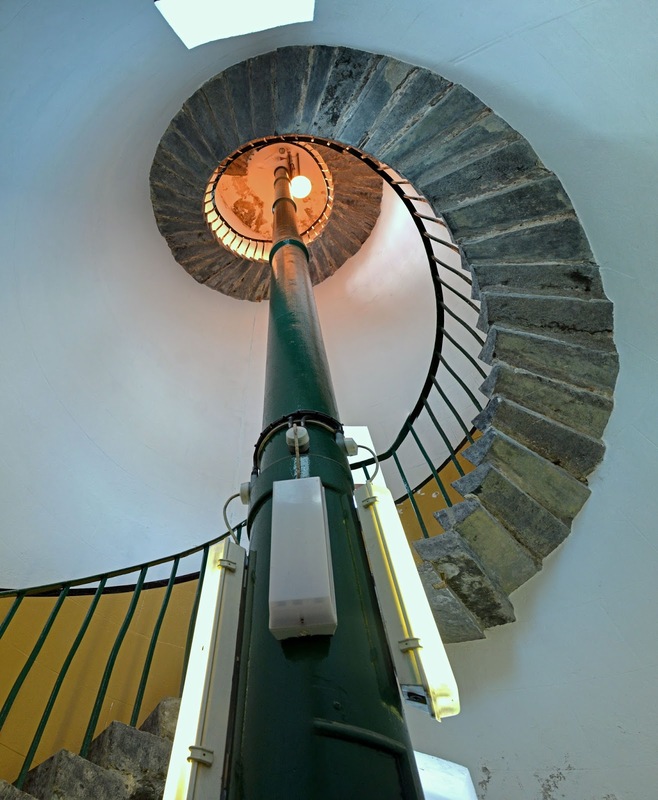 After a while I headed off for a tour of the lighthouse, it was very interesting being able to climb the steps up to the top of the tower, it has quite an interesting history and is well worth a visit if you are in the area, just be prepared for the long climb up and down the cliff path. After the lighthouse It was time to climb my highpoint, I could have climbed it from the lighthouse but I had already decided to drive across to the other side of the mountain and start from another location. 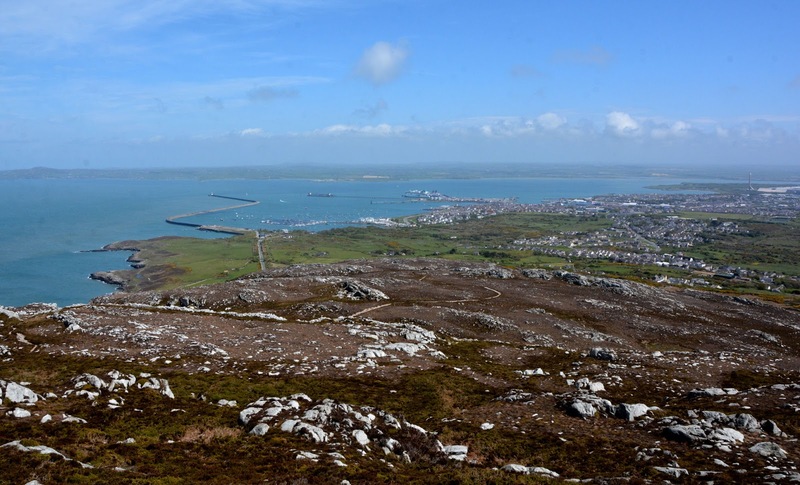 The Holyhead Breakwater Country park is a 106 acre park on the site of a former quarry and is the perfect location to start a climb up Holyhead mountain. The country park has tea rooms and an art exhibition, it also has various memorials, old ruins and a few lakes. I parked in the cr park and headed straight off up the slopes of the mountain. It was not going to be a long walk, I was going to be at the top of the mountain in about 30-40 mins. The routh I walked took me through some residential areas and then onto the rocky grey terrain of the mountain itself. 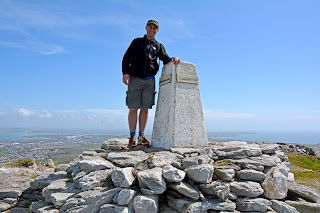 The path climber steadily for a while and then before long it became steeper for one last section and I was then at the top, at 220 metres (722 feet) Holyhead mountain is the highest point of the island of Anglesey. 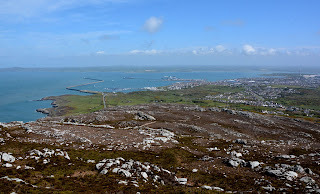 From the top of Holyhead mountain the views were amazing, it clearly is the highest point for miles around because you can see all the way to snowdonia in the east and far out across the Irish sea to the west and south, apparently on a clear day you can see the Isle of Man and the mountains of Ireland. I stopped at the top for sometime having some lunch and drinking tea, also catching up with people back at home, the strange thing about my trips is that I often lose phone signal at the campsites I stay at but then I get an excellent phone signal at the top of mountains so I often get a barrage of texts and messages from various people. It seemed quite a busy highpoint, there were a few visitors to the top while I was sitting having my lunch, I stayed for about 30-40 mins and then headed back down the mountain a different route back to the country park. when I was back at the country park I stopped off for a look around the art exhibition and for a slice of tea and cup of cake (or something like that), then I was back off to the campsite to relax and have my dinner and sleep before my long trip back home the next day. 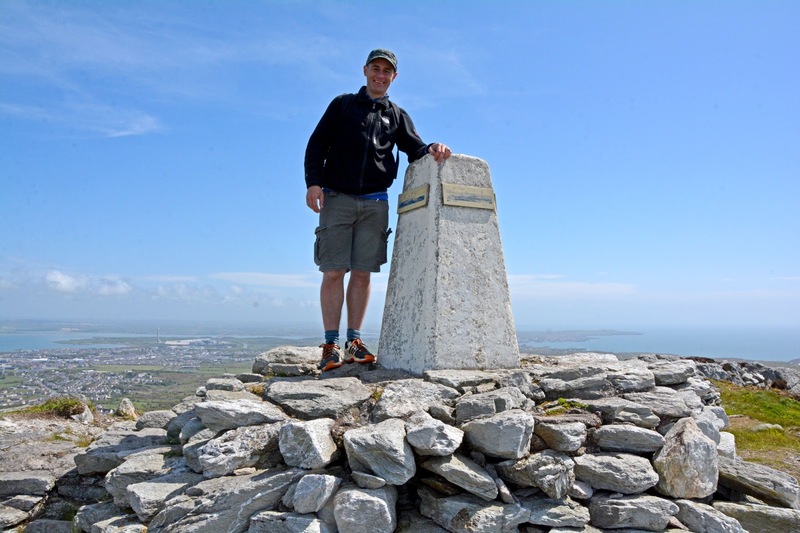 Holyhead mountain was an excellent climb and I really loved Holy island, it has some beautiful scenery and lovely beaches. well worth a visit at any time of the year. I can highly recommend the campsite, it has been one of the best I have visited, they also do B&B if you are not into roughing it - http://www.blackthornleisure.co.uk/.